In keeping with trend of publishing the Income Tax Calculator every year, here is the Income Tax Calculator for FY 2014-15 [AY 2015-16]. Income up to Rs 2.5 lakhs for General Public and up to Rs. 3 lakhs for Senior citizens are now exempted from paying Income tax. Earlier this limit was Rs 2 Lakhs for General Public and rs 2.5 Lakhs for Senior Citizens. The exemption limit for investments under section 80C has been raised from Rs 1 Lakh to Rs 1.5 Lakhs. The exemption on paying interest on Home Loan has been raised from Rs 1.5 Lakhs to Rs 2 Lakh. The income tax slab has changed for General Public and Senior Citizens. This Calculator is for people with only one home. 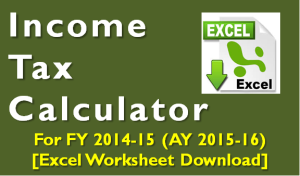 You can also download Income Tax Calculator for FY 2013-14, FY 2012-13 and FY 2011-12 by clicking on respective links. Your suggestions and feedback are welcome! We take joint homelone with my mother in low .we[husband -WIFE]bought a plot my mother in low name [I take P.L .in my sellary when plot bought] my hubby only son my mother in low .total EMI of home lone given by my sallery account.how can i take rebbit in income tax .property not my name . Sorry i could not get your question clearly. But what I could make out you cannot get any income tax benefit on payment of housing loan if the home is not in your name. Thanks for sharing such a useful information and have downloaded the Income tax calculator. Sure will add the advance tax row in the tax calculator. Under Section 80GG The deduction is 24000.00, But your tax calculator accepts only Rs.2000.00, Please clarify if I am mistaken or rectify the error. Thanks Amit for pointing out the error. It has now been corrected. I cant edit cells and it is protected view. If i change it to unprotected view, it is asking password. Can you please help me to unlock this? Yes the cells are purposefully locked to prevent piracy but all the cells that needs input are not locked! Hi Amit, encountered the same that Suresh faced. But, I will downloading the updated version. Downloaded IT calculator 2014-15. On filling my DOB as June 1954,along with date,., the income tax calculator shows age as 59 years only, whereas actual completed age is 60. May pl check. Thanks for pointing out the error. I have corrected it and uploaded the new version. Please download and also share with your friends! Thanks for using the calculator. U/s 80D You can claim maximum deduction of Rs 15,000 in case everyone insured is below 60 years of age and Rs 20,000 if any one of the member is above 60 years of age on medical insurance. I have just tried your income tax calculator for FY 2014/15, and I am getting a taxable income of Rs.2,74,575/- but tax payable is showing only Rs.471/- . Now that the tax slab is 2.50 lakhs how do you justify this tax of Rs.471/- ? There is deduction of 2000 for income upto 5 lakhs u/s 87A. So your tax comes to 471. Let me know in case of further queries. My net income is 2,74,575/- and taxable income would be 22,575/- and 10% on this would be 2257/- approx, as per current tax slab rates. I am impressed by your I.TAX calculator, it is very simple with almost all items. However, I would like to know if you can provide me a calculator covering the retirement entries in the worksheet like PF, Gratuity, Leave encashment, 1/3 commuted pension which are exempt u/s 10 etc. it would be of great help to me as I am retired in Jun’14 with all retiral benefits. Sure Sir, I’ll try to add the retirement components also to this existing tax calculator.